Friday was a great day and boy do I have an itch to shop. It’s been so long since I actually got to go shopping for fun things. Normally it’s groceries or stuff I need around the house. But today I took a half day from work and went to the shopping center. I had the urge to go to Williams & Sonoma and Sur La Table. I bought some pancake molds from Williams & Sonoma, but that was about it, I had more fun at Sur La Table. Here are some of the goodies I bought there. Aren’t those the cutest little spoons. I have a weird thing about baby/little spoons. I love to use them for scooping peanut butter, eating desserts and using it for my yogurt. I love these little guys and I will be using them for more than just Easter dishes. I’m not sure what the little holes are for, but that’s ok, I love the little rabbits. 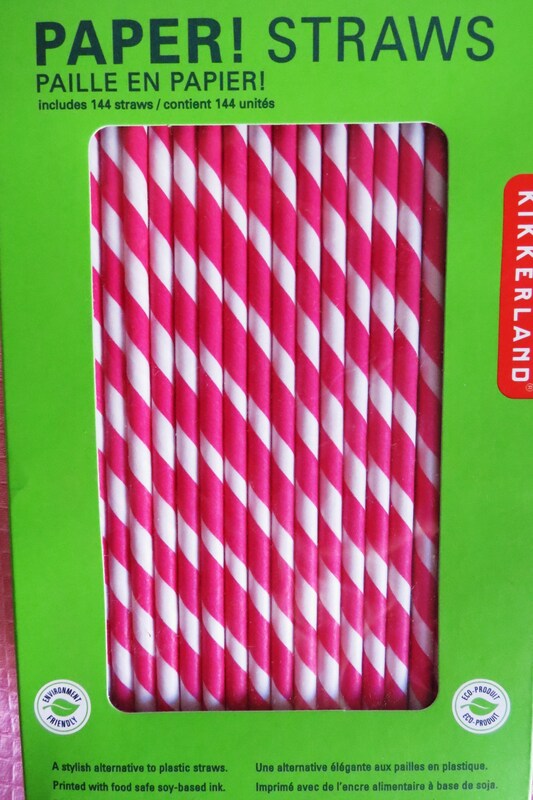 I also got these cute paper straws. I thought they would be fun for props and for summer drinks. I think I had a thing for pink today. I finally bought my immersion hand blender. I don’t know if you recall but about two months ago I was using my old Black & Decker hand blender for blending tomato soup and I heard a crack and then flames shot up the sides, while I was using it. Talk about scary. I threw that one out and was in search of a new one. I didn’t realize how much I really used it until it was gone. I tried using a blender for making my soup creamy and that was a horrible mess. I used it with the same tomato soup and it splattered and exploded everywhere. Ugh! I had red globs of tomato everywhere! That was an ugly mess. So now I am excited I got this pretty hot pink one. 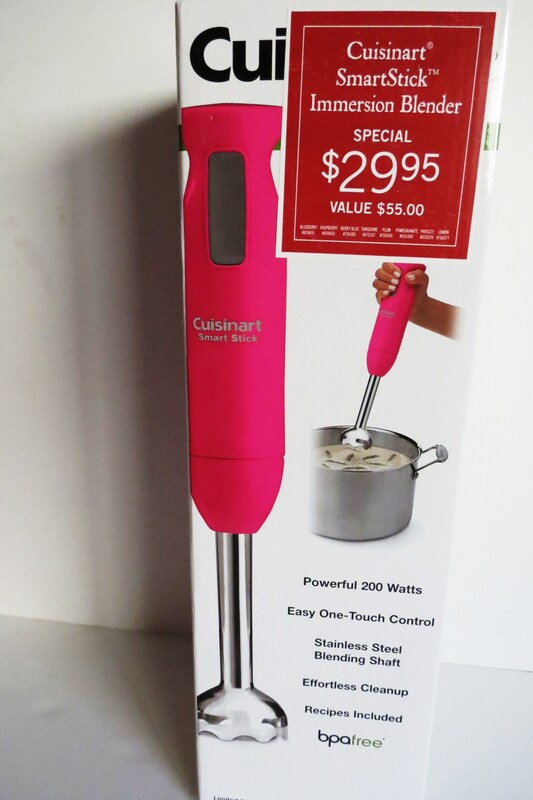 I got the hot pink because Jenny bought me a hand mixer for Christmas and it was Cuisinart in Hot Pink, so I thought it would be nice to getting matching colors. Don’t you love the pink? 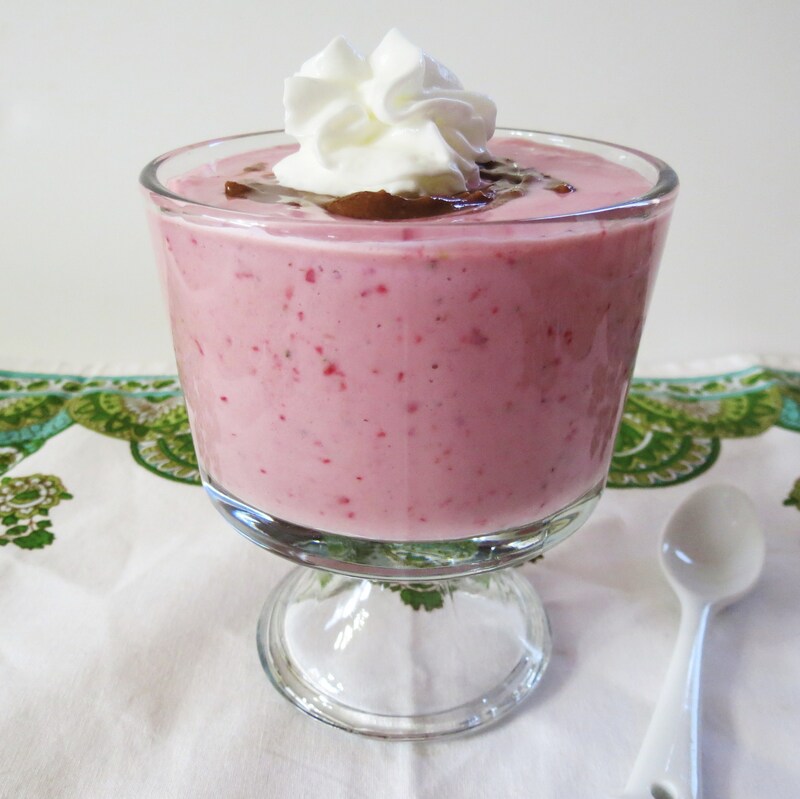 Speaking of pink, I made this for my Friday night dessert. 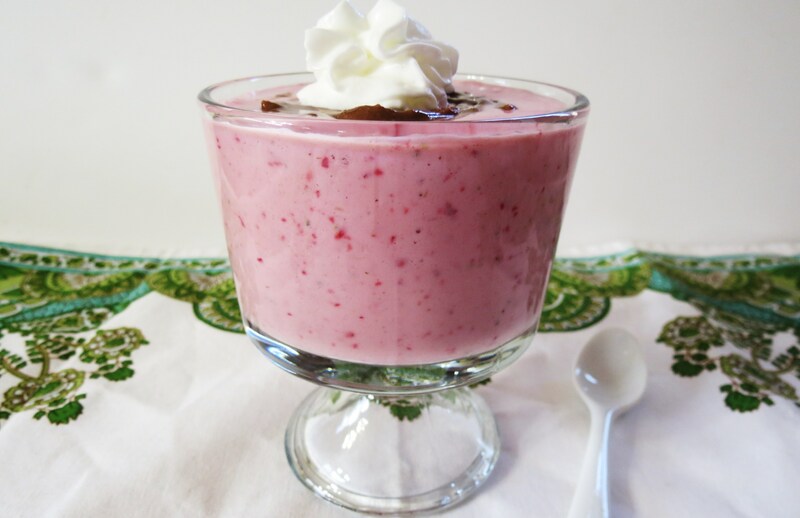 I know a lot of you have seen this dessert, but it’s so good I had to share the recipe for you. I have been on a major smoothie, ice cream, fruit kick lately. It seems I just can’t get enough fruit! I ate a whole pineapple myself, over three days last week. I had a bazillion oranges and about 3 pints of strawberries, not to mention my smoothies I posted this past week. It’s crazy! I’m glad I’m craving fruit over sweets. I’ve been being really good at staying away from the bad sugars and I think fruit is my substitute for it. However I could be overdoing my fruit intake? I tend to get on kicks and I tend to go overboard. 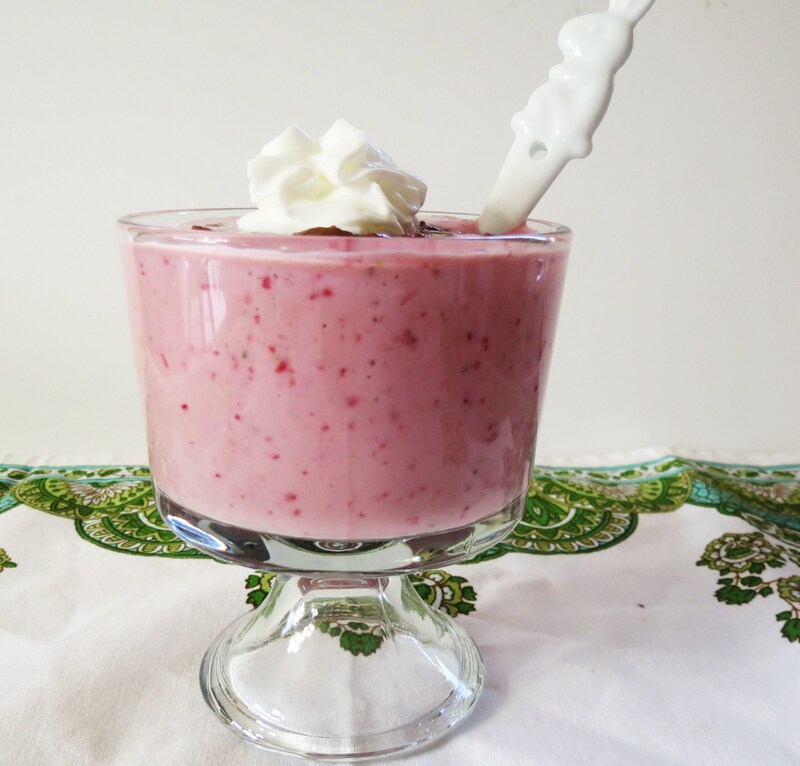 This soft serve is made with a half of a frozen banana, two strawberries and a 6oz container of Chobani’s Vanilla Greek Yogurt. 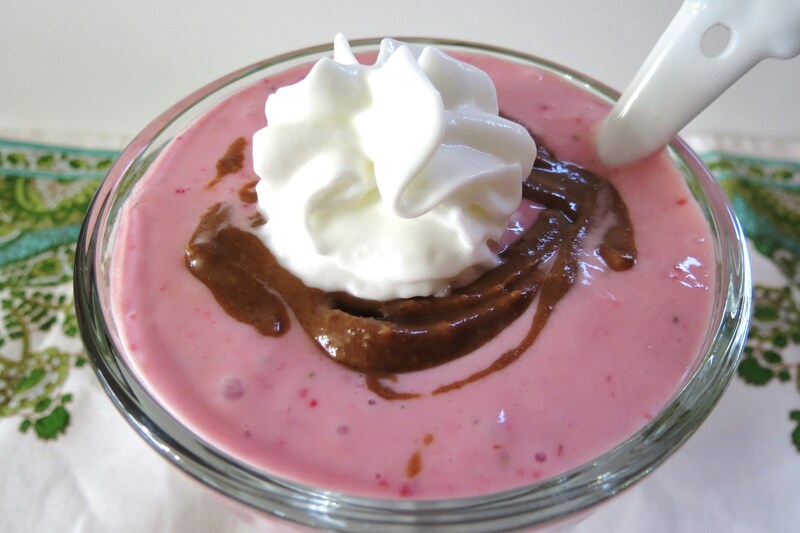 For the top I also added a drizzle of my chocolate almond butter and fat free whip cream. It tasted like a yummy, creamy sundae. When I processed it, it was more of a soft serve ice cream consistency but due to my hundreds of pictures I took, it started to melt. 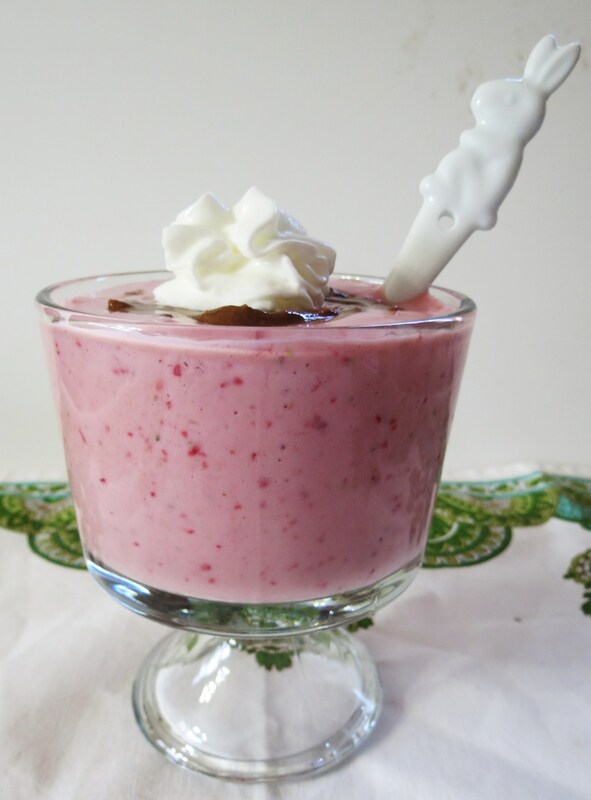 In a blender, add the banana, strawberries and yogurt and process until smooth. 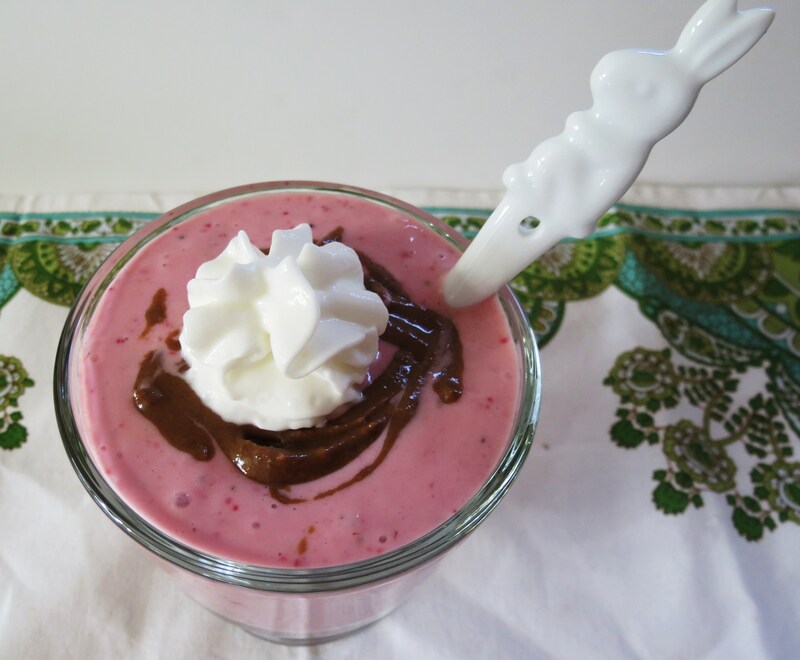 Drizzle with almond butter and top with whip cream. I guess you can tell I was in a pink mood and I just realized I’m even wearing a pink shirt! Do you ever get on color kicks? My normal go to color is red or orange but today it was definitely pink. I think it has to do with all the spring pastel colors out now, however I went for hot pink today! I needed a little spicy color to brighten up the day. I also went to Whole Foods today and let me tell you, do not go there on an empty stomach! I wanted to eat everything. They have the best deli and salad bars ever. I bought some roasted vegetables, which I used for my dinner and for lunch I bought a half a chicken quasadillia and a piece of margarita pizza. I totally carbed out today. I had all intentions of getting a salad, but the pizza was calling me. I bought it and ran to my car and chomped it down like a crazy person. After the guilt, I only ate a few bites of the chicken quasadillia. I was pretty full! That was good and I mean good pizza! I love Whole Foods but it’s 50 miles away from me and it’s to far to travel for grocery trip. I wish they would open one near me! However that could be pretty dangerous. I spent my Friday night at the pool store, Lowes and Homegoods, note to woman, don’t bring your man with you when you go to Homegoods. I couldn’t shop with him around!! But I did get ideas! So with all that it’s getting pretty late and I want to clean my kitchen so it can be ready for morning baking! One of my favorite bloggers posted a bread recipe this week and I want to try it out, and if it turns out, I will share it with you! Crossing fingers!!! Have a wonderful Saturday!!! My tip for the day, if it’s nice out, get out there and enjoy it! Go for a walk, talk to friends and enjoy your weekend!!! For me, I’ll be here online and baking up a storm because the rain is coming. Plus I’m thinking I should make some type of soup. I need an excuse to use my new hand blender!! he he Have a great day!! P.S. If you like please vote for Peanut Butter and Peppers. Just go here! Happy Saturday! Pink is the best indeed. You so deserved a day to go shopping…makes me want to go right now. And did I mention, this dessert looks delicious too?! Happy Saturday to you too. 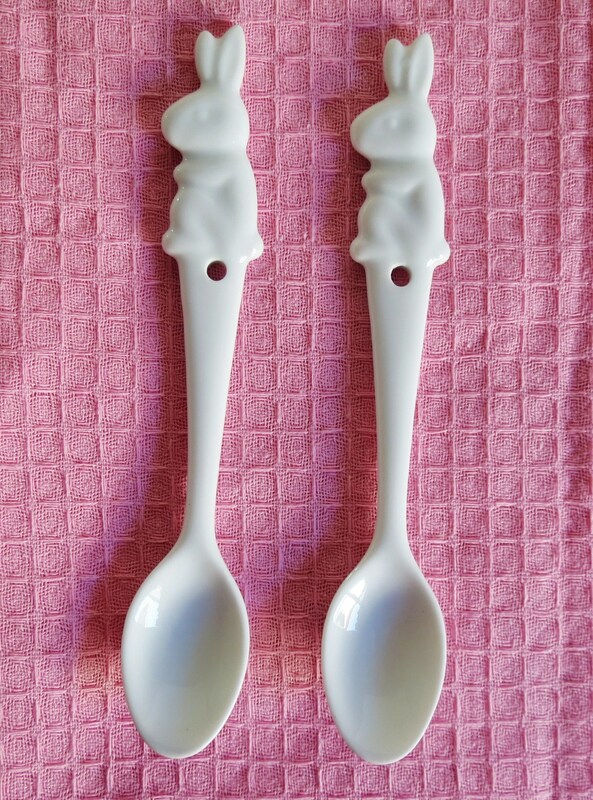 The bunny spoons are absolutely precious. The frozen yogurt looks delish. You picked two fantastic stores for your shopping splurge 🙂 I love those straws! They are perfect for summer. And the soft serve looks delicious! I am just so glad these stores are not near me, they could become very dangerous!! Bookmarked and happy to be on blog! I love making banana based ice cream – so creamy, and feels decadent 🙂 Love your spoons, very cute! Soft serve is so nice and so easy! I love it! It’s my go to when I have an ice cream craving! I am so jealous that you have an actual Sur la Table store! I have to rely on ordering online. And I love love love my immersion blender have fun with it!